On Nov. 24, 2013, Iran and the world’s six major powers reached a historical interim agreement on Tehran’s controversial nuclear program. Iran committed to halting the most sensitive aspects of its program and allowing expanded U.N. nuclear inspections in return for modest sanctions relief. The first step towards a comprehensive deal, initially set to last for six months, is renewable by mutual consent. Foreign ministers from the United States, Britain, China, France, German, Russia and Iran came to an agreement after four days of intense negotiations in Geneva—the third round of talks since President Hassan Rouhani’s election in June 2013. The following is the full text of the interim agreement and a fact sheet released by the White House. The goal for these negotiations is to reach a mutually-agreed long-term comprehensive solution that would ensure Iran’s nuclear program will be exclusively peaceful. Iran reaffirms that under no circumstances will Iran ever seek or develop any nuclear weapons. This comprehensive solution would build on these initial measures and result in a final step for a period to be agreed upon and the resolution of concerns. This comprehensive solution would enable Iran to fully enjoy its right to nuclear energy for peaceful purposes under the relevant articles of the NPT in conformity with its obligations therein. This comprehensive solution would involve a mutually defined enrichment program with practical limits and transparency measures to ensure the peaceful nature of the program. This comprehensive solution would constitute an integrated whole where nothing is agreed until everything is agreed. This comprehensive solution would involve a reciprocal, step-by step process, and would produce the comprehensive lifting of all UN Security Council sanctions, as well as multilateral and national sanctions related to Iran’s nuclear program. There would be additional steps in between the initial measures and the final step, including, among other things, addressing the UN Security Council resolutions, with a view toward bringing to a satisfactory conclusion the UN Security Council’s consideration of this matter. The E3+3 and Iran will be responsible for conclusion and implementation of mutual near-term measures and the comprehensive solution in good faith. A Joint Commission of E3/EU+3 and Iran will be established to monitor the implementation of the near-term measures and address issues that may arise, with the IAEA responsible for verification of nuclear-related measures. The Joint Commission will work with the IAEA to facilitate resolution of past and present issues of concern. - Provision of specified information to the IAEA, including information on Iranˈs plans for nuclear facilities, a description of each building on each nuclear site, a description of the scale of operations for each location engaged in specified nuclear activities, information on uranium mines and mills, and information on source material. This information would be provided within three months of the adoption of these measures. - Submission of an updated DIQ for the reactor at Arak, designated by the IAEA as the IR-40, to the IAEA. - Steps to agree with the IAEA on conclusion of the Safeguards Approach for the reactor at Arak, designated by the IAEA as the IR-40. - Daily IAEA inspector access when inspectors are not present for the purpose of Design Information Verification, Interim Inventory Verification, Physical Inventory Verification, and unannounced inspections, for the purpose of access to offline surveillance records, at Fordow and Natanz. - Pause efforts to further reduce Iranˈs crude oil sales, enabling Iranˈs current customers to purchase their current average amounts of crude oil. Enable the repatriation of an agreed amount of revenue held abroad. For such oil sales, suspend the EU and U.S. sanctions on associated insurance and transportation services. 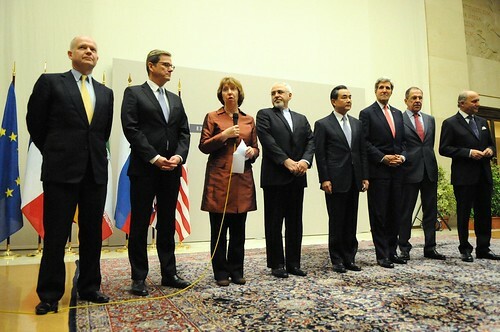 The P5+1 and Iran also discussed the general parameters of a comprehensive solution that would constrain Iran's nuclear program over the long term, provide verifiable assurances to the international community that Iran’s nuclear activities will be exclusively peaceful, and ensure that any attempt by Iran to pursue a nuclear weapon would be promptly detected. The set of understandings also includes an acknowledgment by Iran that it must address all United Nations Security Council resolutions – which Iran has long claimed are illegal – as well as past and present issues with Iran’s nuclear program that have been identified by the International Atomic Energy Agency (IAEA). This would include resolution of questions concerning the possible military dimension of Iran’s nuclear program, including Iran’s activities at Parchin. As part of a comprehensive solution, Iran must also come into full compliance with its obligations under the Non-Proliferation Treaty (NPT) and its obligations to the IAEA. With respect to the comprehensive solution, nothing is agreed until everything is agreed. Put simply, this first step expires in six months, and does not represent an acceptable end state to the United States or our P5+1 partners. - Restricted access to the U.S. financial system. During the six-month initial phase, the P5+1 will negotiate the contours of a comprehensive solution. Thus far, the outline of the general parameters of the comprehensive solution envisions concrete steps to give the international community confidence that Iran’s nuclear activities will be exclusively peaceful. With respect to this comprehensive resolution: nothing is agreed to with respect to a comprehensive solution until everything is agreed to. Over the next six months, we will determine whether there is a solution that gives us sufficient confidence that the Iranian program is peaceful. If Iran cannot address our concerns, we are prepared to increase sanctions and pressure. In sum, this first step achieves a great deal in its own right. Without this phased agreement, Iran could start spinning thousands of additional centrifuges. It could install and spin next-generation centrifuges that will reduce its breakout times. It could fuel and commission the Arak heavy water reactor. It could grow its stockpile of 20% enriched uranium to beyond the threshold for a bomb's worth of uranium. Iran can do none of these things under the conditions of the first step understanding.